I put off writing about the Tunisian on the Diagonal class because I kept feeling like I had nothing to say, but also too much! Here’s another paradox: I feel like I’ve been teaching this class since 2010 and yet I never have, exactly. How can all of this be true? I figured it out after writing the section about its 2009 roots below. Crocheting Tunisian diagonally is a huge topic based upon simple and powerful principles. Vary one thing a little, factor in some momentum, and everything ends up dramatically different. For contrast, travel back to 2009 with me for a bit. 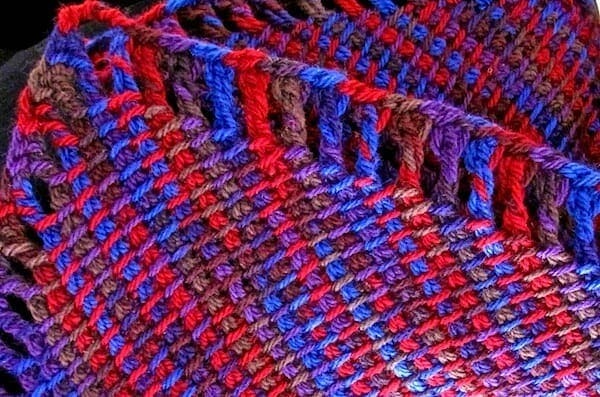 Nine years ago my first diagonal crochet design happened: the Five Peaks Shawl prototype. (The pattern was published in 2010 in Interweave Crochet Magazine). Effect of the “squeeze-it-in” method shows in the left swatch. Not recommended for a shawl. There was almost nothing on diagonal Tunisian crochet from corner to corner, or “C2C”. With C2C you increase steadily along both row ends to widen, then decrease steadily until you end at the opposite corner. The default increase method back then didn’t have a symmetrical, polished drape. I blogged about it (and the photo at right) in June 2009 because that’s when I was working out the increase method for the Five Peaks Shawl. Tunisian crochet hooks larger than size 6.0 mm (J) were scarce in any style and length, whether straight, flexible, double-ended, short, or long. When you found one, you put up with whatever its material, surface finish, and hook shape was. Remember that? My options were either a long straight 6.5 mm (K) or a discontinued 9 mm (“M/N”) flexible hook from eBay. I needed a size between these two. Too bad! Back then, publishers needed designers to use crochet hooks that were commonly available in stores. I worried that I wouldn’t be able to sell the Five Peaks pattern to a magazine. Fortunately, Tunisian hook choices were improving. Only three months later I blogged “Heaven is a Crochet Hook for Every Need”. Nowadays I keep a range of Tunisian hook sizes and lengths. We Tunisian crocheters have been enjoying a renaissance for our craft! It had barely started in 2009. Back then, most crocheters still assumed the nature of Tunisian crochet was to be thick, kind of stiff, and with a stubborn curl. Not something that could cascade and swing from the shoulders like a waterfall, or look like a lacy weightless veil. Each time I’ve taught a Tunisian crochet class since 2010, the students bring more skills and experience to the room. Newer Tunisian crocheters understand things faster. This became really noticeable around 2013. Five Peaks classes were the first I taught on diagonal Tunisian crochet. It was ahead of its time in 2009. Since then I’ve learned to start every Tunisian topic with a quick review of the relevant basics. People of all skill levels seem to welcome this. It seems to pull together and standardize the new things everyone is learning from different designers. For 2018 I’m excited to be starting out with a review of a different set of basics because when we crochet Tunisian on the diagonal, there are clues we can be looking for but may not recognize for awhile. Things may look wrong for awhile and yet be so, so right.